Effective multitasking is critical in information work. In this research, we have been working to cultivate a more nuanced understanding of multitasking than has previously been reported in the research literature. Whereas most investigations have approached multitasking as an individual activity, our research takes a new perspective on multitasking: focusing on multitasking as a collaborative social system, i.e., how multitasking impacts a team's information work and efficiency. The central focus of this research has been to study how multitasking takes place within small groups of information workers. More specifically, we are exploring task interdependencies, roles and responsibilities, information flow, communication media, work styles and temporal patterns that result from multitasking within workgroups. 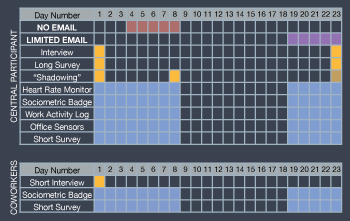 Because e-mail is the most common channel for communication and coordination among information workers--and a significant source of interruptions during the work day--we have designed an in situ experimental study to explore the role that email plays both for coordination of work among colleagues and as an instigator for multitasking in individual work. After gaining an understanding of what typical work quantitatively and qualitatively "looks" like within various workgroups, we are manipulating access to email for some of the participants over the course of a week. This is the first study that empirically examines how multitasking and social networks change when e-mail access is limited or suspended, and we are taking advantage of this unique opportunity to collect a variety of social, technical, and physiological data from our study participants. 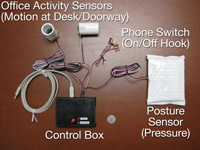 For this study, we developed a suite of physical sensors and a computer activity logging application to capture a detailed record of the low-level actions that comprise an individual's everyday work. We are augmenting the data collected by these sensors with in-person ethnographic observation (shadowing), monitoring participants' heart rate with commercial heart monitoring straps, and recording instances of face-to-face interactions within work teams using sociometric badges developed by Sandy Pentland's human dynamics laboratory at the MIT Media Lab. Mark, G.J., Voida, S., & Cardello, A.V. (2012). “A Pace Not Dictated by Electrons”: An Empirical Study of Work Without Email. In Proceedings of the SIGCHI Conference on Human Factors in Computing Systems (CHI 2012, 555-564), Austin, Texas, May 5–10. ACM Press. CHI 2012 Best Paper Nominee (among the top 5% of all submissions).